300 articles and commentaries that try to convince readers that the answer to this question must be yes. Dismantle all bombs and reactors before the centennial of the Trinity Nuclear Bomb Test on July 16, 1945. Sooner would be better, but since the human race loves centennials, this is one to put in your calendar. Two months before Charlie Hebdo became a famous name, I came across a youtube video of the French actor Nicolas Lambert performing his play Avenir Radieux (A Radiant Future). It was just a short clip, and it seems no other video recording was made of it, but I was intrigued. I ordered the book, read it, then contacted the publisher to ask if I could take it on as a translation project. The translation will be finished soon, so this is some advance publicity for the English edition. I’m not an agent for the publisher, but if someone out there in the publishing world is interested, they can contact me and I will put them in touch with the publisher (Editions L’Echappée, Paris) or the author. Part 1 is a review that appeared in Charlie Hebdo’s special nuclear edition in 2012, written by Fabrice Nicolino, one of the persons injured in the January 7th shootings. Part 2 is the promotional blurb from the French edition. published in The Nuclear Swindle (L'Escroquerie Nucléaire), special edition of Charlie Hebdo, September 2012. Nicolas Lambert invented a new genre that could be called investigative theater. In A Radiant Future: A French Fission he lights up the nuclear lobby while keeping the audience laughing. Nicolas Lambert was born in Picardie in 1967. In the beginning he was a typical high school student, a lycéen. It was there, still not even an adolescent, that he fell for the theater. As a student of philosophy at university in Nanterre, he continued to do amateur theater and gained experience at the university theater group. He went on to manage that theater from 1990 to 1992. The rest followed a natural course. In 1992, he founded, with the actor and musician Sylvie Gravagna, the Charlie Noé Company. They presented their creations, first Arlequin poli par l’amour, for an audience of young people in Seine-Saint-Denis. Settled in Pantin, the company went on to produce fifteen shows by 2003. And then, out of the blue, the famous Elf trials began. In 2003, all the scoundrels who had gorged themselves on Elf money were brought to the docket. Lambert attended all the sessions, and wrote a little response to what he witnessed. In 2004, just before creating the company Un pas de côté, he launched his magnificent new production called Elf, the Pump of Africa. Every word in the script had been uttered in the trial. Lambert incarnated, madly and comically, all the corrupt individuals involved in the scandal. Without realizing it, he had invented a genre—investigative theater. In the same vein, he created a piece on nuclear history, which, after a triumph in all of France, was staged at the Festival d’Avignon. 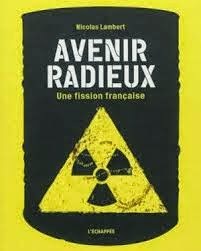 His title: A Radiant Future: A French Fission. Charlie isn’t lying to you when he says it’s very good, and better than that. The quality of his device hinges first on faultless documentation. Lambert did his homework and got help from some excellent researchers. Apart from the trivial matter of the gloomy Eurodif file (to be discussed elsewhere), the facts and the characters are all there in their exact places. But nothing would work without Lambert’s astonishing incarnations. 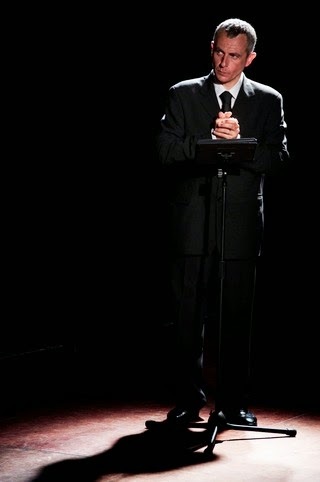 The characters are many, but he does them all as a one-man show, on the stage and in the aisles, leaping from one spot to another, changing voices, moving from light to shadow. 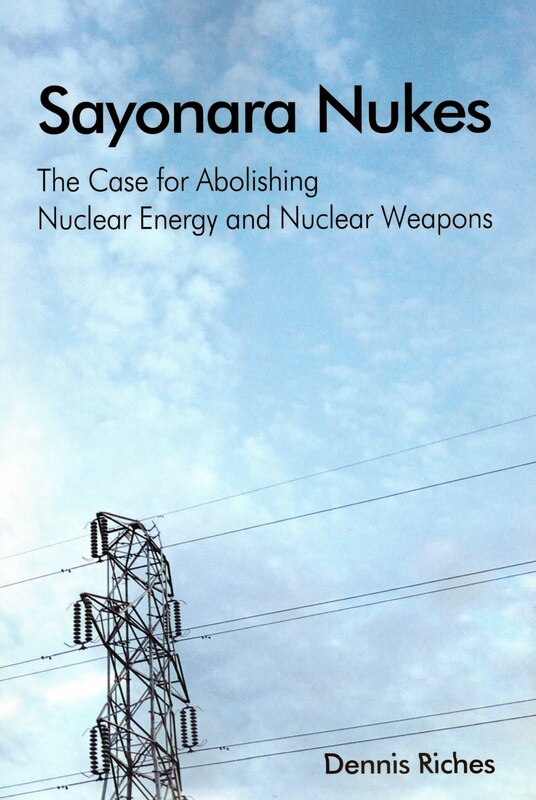 The piece begins with a public information meeting concerning a proposed nuclear power plant. Hilarity ensues. Lambert is Mr. Loyal, Mr. EDF (Electricité de France) Mr. Elected Official, but also the simple dumb asses who’ve come to puff themselves up. What follows are numerous samples of official discourse, of ministers, presidents (Sarkozy is very well done) and nucleocrats. We must keep in mind that all the words chosen by Nicolas Lambert were actually spoken. This is an element of the play that gives the performance its considerable impact. The best characterization is without doubt that of Pierre Guillaumat, the man who led the French nuclear program for decades. Lambert surpasses himself, camping the former head of the CEA (Commissariat à l’Energie Atomique) in semi-obscurity, pipe in mouth, answering the questions asked by a German journalist. I left the theater wondering who I’d like to tear into first. And it’s not over. Lambert is preparing another play about the arms trade. This trial was the final judgment on what was called “l’Affaire Elf,” a corruption scandal of the Elf Aquitaine oil company that ensnared several high-profile figures in the political and business establishment. It has been called the largest corruption scandal in a Western democracy in the entire post WWII era. A reader pointed out that the genre isn't actually new. It's also called documentary theater or verbatim theater. Anna Deveare Smith is a primary example. She did a one woman play with many characters from the LA riots called Twilight: Los Angeles, 1992. Eurodif refers to the uranium enrichment plant that was opened in 1973, built in France in partnership with other Western European countries--and Iran! Nicolas Lambert prepared this play about nuclear for seven years, pouring over heaps of articles and books, visiting nuclear power plants, attending public debates on the EPR reactor proposed for Penly, meeting union leaders, intermediaries, militants, corporate spokespersons for Areva and EDF—and then March 11, 2011: Fukushima. Then this enormous task that he was conducting alone, in the shadows of a polite indifference, took on a sudden significance. 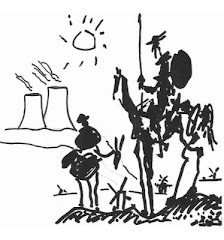 The silence of the media, parliamentary apathy, the disdain for antinuclear activists (seen at best as lovable old cranks), the reassuring refrain that there was no risk of a major accident: all of these perceptions suddenly disintegrated. Barely finished, his play now had an audience that was ready to listen. Tour de force: In two hours and in 23 characters, all performed by Nicolas Lambert, we are taught how France became the most nuclearized country in the world, beginning in 1945, when de Gaulle created the CEA (Commissariat à l’énergie atomique) in order to make an atomic bomb, until our times when those who wish to get out of nuclear remain inaudible. Through the choking laughter emanating from irradiated neurons, Lambert makes us see it all: the fable of energy independence, the farce of public debates, the discreet but essential role of great servants of the state like the stunning Pierre Guillaumat, one of the key characters of this saga, the Eurodif Affair, the terror attacks in Paris in 1986, the edicts of Messmer and Pompidou, the procrastination of Mendès-France and Mitterand. The script of the play is supplemented with a long interview with the author, background information, illustrations and a chronology. In short, everything that the nucleocrats don’t want to think about. What has happened to Japan's radioactive cars?